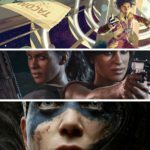 Games offer players the opportunity to fully immerse themselves in someone’s world and empathise with that experience, in a way no other medium can. 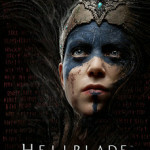 With Hellblade: Senua’s Sacrifice, developer Ninja Theory explores this premise and tackles the difficult subject of mental illness. 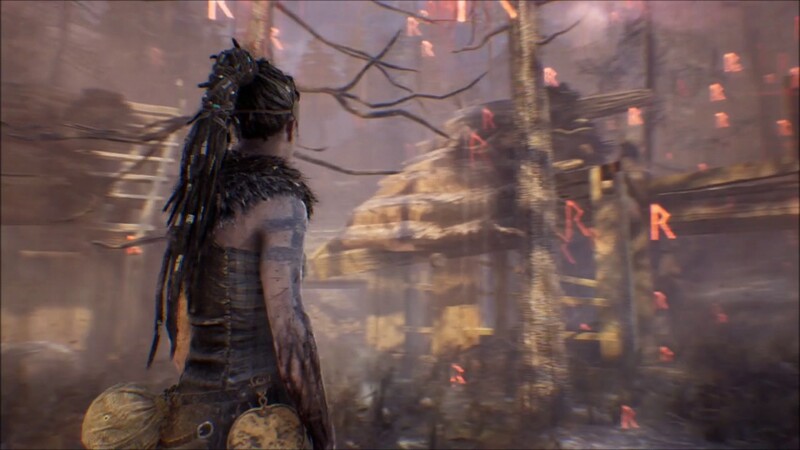 In Hellblade: Senua’s Sacrifice, Senua is a Celtic warrior returning to her village, which has been raided by Vikings. In the destruction, she discovers that her lover, Dillion has been strung up and sacrificed to Norse gods. The game follows her quest to recover Dillion’s soul, on a journey that will take her to the Norse underworld, Hel. So far, it’s fairly standard stuff, except Senua is living with mental illness and psychosis. From the moment we first meet her, paddling down a waterway, Senua experiences voices and sees things. It’s an unsettling feeling, enhanced by the use of 3D binaural sound. If played while wearing headphones, voices sound as if they are coming from different parts of your head. This has you looking over your shoulder and wanting to tell them to stop, as they berate and undermine you, making the audio the most effective part of the game. Ninja Theory worked closely with mental health professionals, professors of psychology and people who have come through psychotic episodes. These experts became part of the development process, offering advice on the portrayal of Senua’s mental illness. At times, Senua is plunged into a dark, brooding world with icy rain and the voices mock her with things like “she’s doing it wrong” or “she’s going to fall”. And then, when she succeeds, the voices become more positive and the world is returned to bright sunshine, leading the player to question what they see at every turn. Senua’s psychosis also becomes part of the gameplay. She sees patterns in her environment, such as intersecting tree branches and shadows, which the player has to line up to create runes to open doors. Her hallucinations also fragment the reality around her and this is used cleverly in the game to change the appearance of whole sections of levels to solve puzzles. More visual disturbances see surfaces slide over each other, lending a menacing atmosphere. One section plunges Senua into complete darkness and the player only has the rumble feedback of the controller to help them find the way. Shadowy creatures breathe in your ear in the darkness, in a tense dark from one pool of firelight to another. 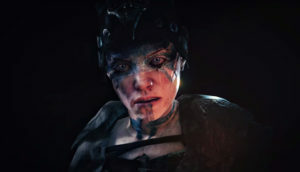 When the player fails, Senua is afflicted by a growing darkness, which creeps up her arm with each game over. When it reaches her head, Senua will die and all progress will be lost, the game tells you. This adds another layer of tension, but of course nothing is as it seems for Senua, so you’re never quite sure how close you are to this death. Some may start Hellblade and never finish it, thinking it is merely a clever idea wrapped in a fairly simple combat game. Throughout the game, Sensua meets ethereal Northmen who step forward to challenge her to combat. 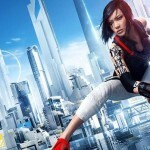 Once you learn, the block, parry, attack combat pattern and gain the upper hand with her bullet-time style ‘focus’ ability, the fights are fairly repetitive. However, as the game moves on, there is less focus on these humdrum encounters and the game becomes more interesting because of this. Hellblade: Senua’s Sacrifice looks gorgeous. 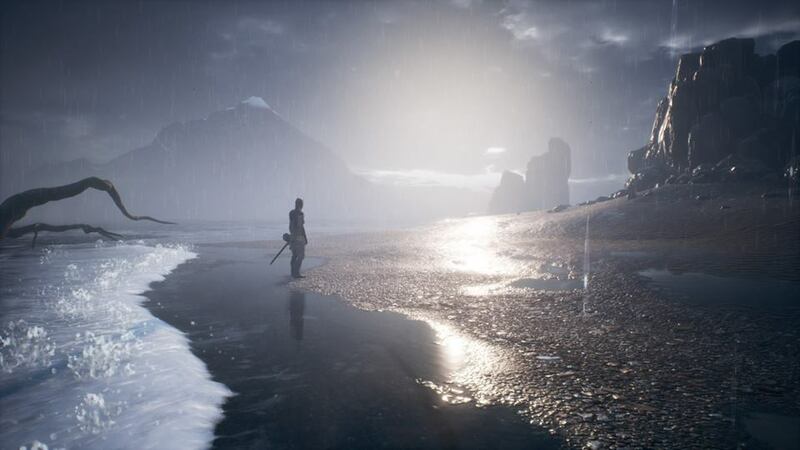 The bleak Norse world with tattered banners fluttering in the wind and the thin, northern sunlight glinting of sea soaked rocks, all add to the feeling of Senua’s isolation both in her quest and her illness. Added to this is the incredible motion capture of a strong performance from Melina Jeurgens as Senua, for an emotional experience. Although, her RP (received pronunciation) accent did break the immersion, as Senua is an ancient Celt from Orkney, but sounds like she’s from Cambridge. 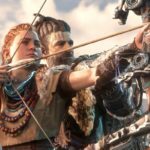 Ninja Theory have obviously approached Senua’s story and condition with a huge amount of respect. Although the visual and audio elements are effective in making it a tense, dark and often scary experience, I’m not sure it helps me understand the consequences of psychosis much more. We don’t really get to explore Senua’s relationships and how her mental health impacts her life, other than her banishment. 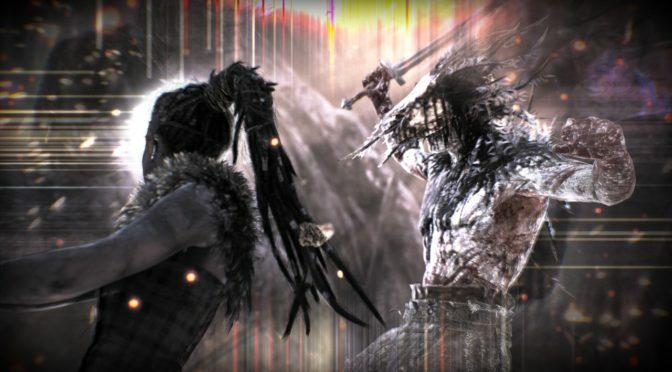 Despite these shortcomings, Hellblade: Senua’s Sacrifice is well worth playing. It’s a beautiful game that plays with Senua’s perception of the world to unsettle the player and create interesting gameplay elements. The Norse setting and snippets of lore all add to this dark, sometimes terrifying journey with a character I totally engaged with.